I’m always happy to read a tale of justice and happiness. Is there anything better than the girl getting her comeuppance and finding herself with the world at her feet? I think not. 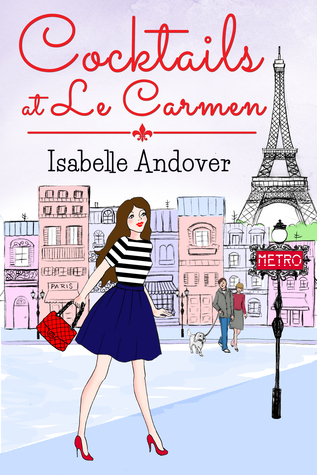 This lovely novel was told from Chloe’s perspective- a twenty-something career woman who finds herself posted to Paris for a year contract when others around her are facing redundancy. She’s a bit unsure about leaving behind boyfriend Scott but he seems to be encouraging about it so why not? Off she goes to Paris where things at home fall apart, of course, and she has to make a new life for herself in France- rather more permanently than she’d anticipated. With a host of lovely friends- ones who are really actually very helpful for life crisis moments and ones who are there to pick out a great outfit Cocktails at Le Carmen moves swiftly from girl-in-love to girl-discovering- what-she-wants for herself. The boyfriend characters are to be expected but that sort of makes the plot regardless of us being able to predict their flaws! What I liked about the novel was the ease with which I became attached to Chloe. I quite liked her from the beginning and despite her being blind to Scott at first and despite her letting her sister walk all over her I think she only needed a bit of confidence to be herself. I’d actually be interested to see how Chloe’s life is in about ten years! Thank you to Simon & Fig for our review copy. All opinions are our own.